The jury award requires that an awardee be selected by an independent, interdisciplinary jury — one that represents both the sciences and all political directions—and that public online voting also be taken into consideration in the final decision. 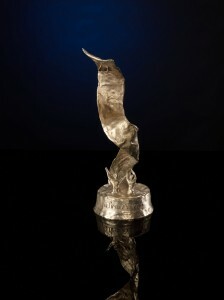 The sculpture of the MIND AWARD shows a base, out of which a man and a woman are stretching up from the hips. Behind these two human-beings, from the same ground, develops a very dynamic spiral, which winds up and has in the end two wings indicated. The groundwork symbolizes the foundation for evolution, the people stand for the aspiration of man for development and knowledge. The rising spiral of self-awareness is finally inspired by education. Similarly, comparisons to the old archetypal symbols are attached, like a snake, Kundalini energy, or wind and spirit forces. "Art comes from ability." A true work of art is self-explaining. Therefore, at last, some facts about material and format. 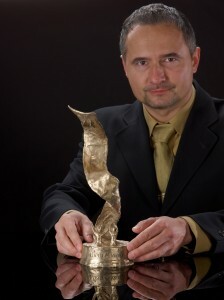 The roundabout 2.5 kilogram tin bronze figure was produced in the complex lost wax process. Thus, each sculpture is unique. Therefore the Prize has a different total height from 35 to 42 cm, the diameter of the base is 12 cm. Achim Kunst said when first handing over the sculpture: "Up to the hip we are hold by the earth, and from the hip on we are taken by consciousness. If we are unconscious, we fall down. If we are further developed, the consciousness moves like a spiral and is boosted. So we need to just be aware, collectively and individually. Physically the spine begins at the tailbone. Thus consciousness is existential. " What is at stake, probably the best describes the legendary poem by the German writer Hermann Hesse.